I carry a Chico bag at all times. It’s so easy to whip out of my purse whenever I need a bag for shopping. Happy in a school uniform for 12 years when I was growing up, I now usually wear the same thing to work every day: black pants and white tee shirt or turtleneck. I save veggies, chicken bones, cheese rinds in the freezer until I make them all into stock. I started an organics collection program in my NYC apartment building so all of our food scraps can find their way into compost. I take plastic bag and other film waste to my local grocery store for recycling. I order my coffee ‘to stay’, and I take a reusable coffee cup for the times when I’m on the go. Preventive maintenance keep my things new looking longer and lasting a long time. I make sure to regularly polish my shoes and other leather goods to make them last a long time. As soon as I drop something on a white blouse or the carpet, I blot up the mess to make sure stains don’t set. I reuse Ziploc bags and store my veggies in those Mrs. Meyers Green bags so they will last longer. Just bought one of those Rubbermaid Produce Savers, and am enjoying trying it out. I use a refillable water bottle, bring my own bag and coffee mug. I carry a reusable spork and napkin. I’ve got a collection of glues in a specially marked Ziploc bag ready to repair anything from wood and metal, to fancy plates and tea cups. 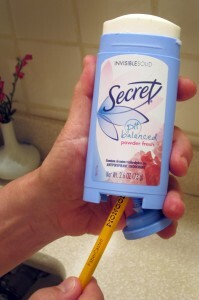 How to get all the antiperspirant from the container. I proudly admit to taking the half-used bars of soap from the hotel shower, along with partially used little bottles of lotion. Have rarely bought a bar of soap in years! I attack my antiperspirant container with a pencil and get an additional inch of product that would otherwise go to waste. I scrape the sides of mixing bowls and inside the mayo jar with some extra flexible spatulas. It’s amazing what you can get if you know how to scrape! I use the reverse side of paper in my home office. I keep pens around until the ink has really dried up, and sharpen those pencils down to the nub. We reuse envelopes in my office — and have extra large mailing address labels so we can cover up the old address. 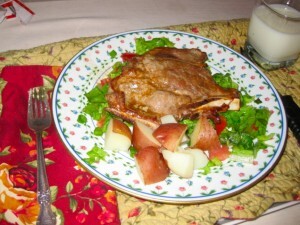 Jacquie Ottman’s Pork Chop “a la Packette” flavored with leftover duck sauce packets. I carry a zipper bag in my purse so I can take home uneaten food from restaurants. (I even like to rescue cheese cubes and crackers from an hors d’ouevres tray. A lover of fine bread, I’m not afraid to ask for the bread to be wrapped up. (Apparently so does Fredrica Rudell. 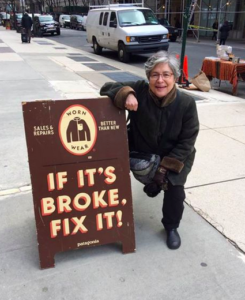 Check out her post, Leave the Gun, Take the Cannoli — and the Bread Basket). I sell things on ebay, Craig’sList.org, and give things away on Freecycle.org. I pool leftovers with neighbors into yummy shared meals. I started a ‘Take a book, Leave a book’ library in my NYC apartment building. Read more here. 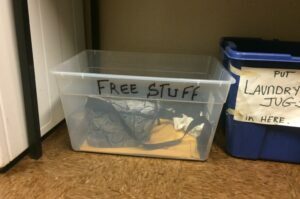 I started a Free Box in my building’s laundry room. I even have a small one in my front hall. I take things to thrift stores (and happily grab the tax deduction). I think previous owners of the things we find in thrift stores should leave a note. Read more here. I love to prowl flea markets and antique malls, looking for bargains and just having fun looking. I ‘regift‘ with friends to make everyday occasions special. Enjoy this post, too. I share my scanner, copier and printer with neighbors. For 22 years I lived in a 280 square foot studio apartment; now I live and work in 636 sq ft. consolidated home and office, a 40% reduction that saves me one bathroom, one kitchen, one electricity bill, telephone bill, DSL line and heating. I work from home, so I save time, money and anguish on the commute (Have you ever tried the #6 train in NYC during rush hour? ); and I don’t waste space having an office part of the time, and an idle home the rest of the day. I’ve never owned a car. I share cabs. I walk practically everywhere or take the subway, train or bus, and take advantage of opportunities to catch up on all those articles I cut out from the paper and my neighbors and I share our newspapers and magazines with each other. I make presents (or openly regift) rather than shop for new things. One thing that I’m especially proud of was the cookbook of recipes that I compiled from five generations of our family. I gave it to everyone in my family for Christmas in 2000 in lieu of regular gifts. I take the water from the boiled egg and use it to water my plants. If I had a garden, I really would shower with a bucket and water my garden, I just know it. For now, I’ll speed things up in there with a little encouragement from my shower buddy (timer). 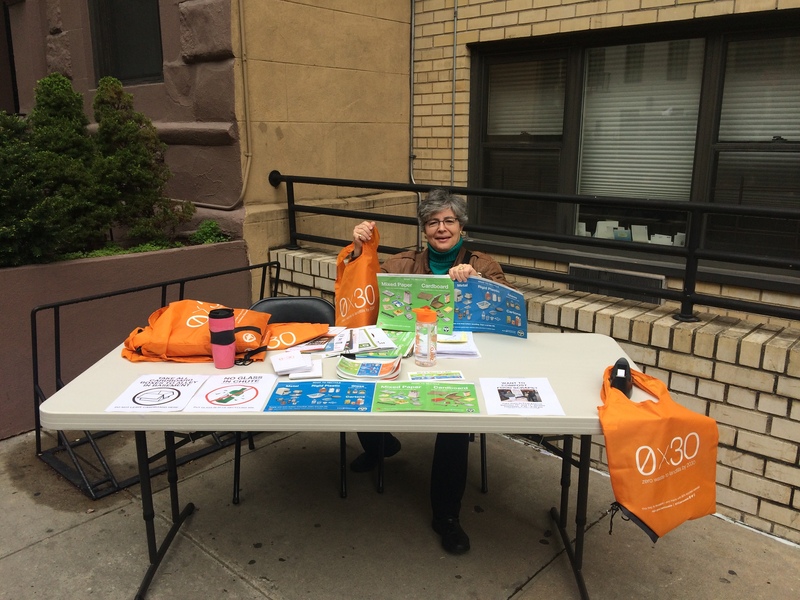 I spearhead recycling education and outreach as a member of my Upper East Side NYC co-op board. 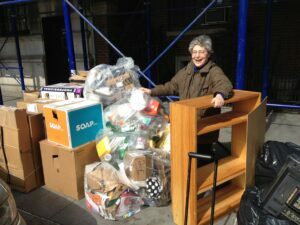 As founding chair, Residential Recycling and Reuse Committe of the Manhattan Solid Waste Advisory Board, I am researching best practices for engaging residents of multi-family buildings in recycling, reuse and composting.